After being diagnosed with schizoaffective disorder and receiving her service dog, General, in 2014, Anne Cummings realized she wanted to give back to those living with chronic conditions, disabilities and mental illness. In 2015, she launched Anne Cummings Studios, a line of greeting cards for people dealing with mental health challenges. The comfort and companionship Cummings receives from General made her realize that many people are lacking the love and affection they need. 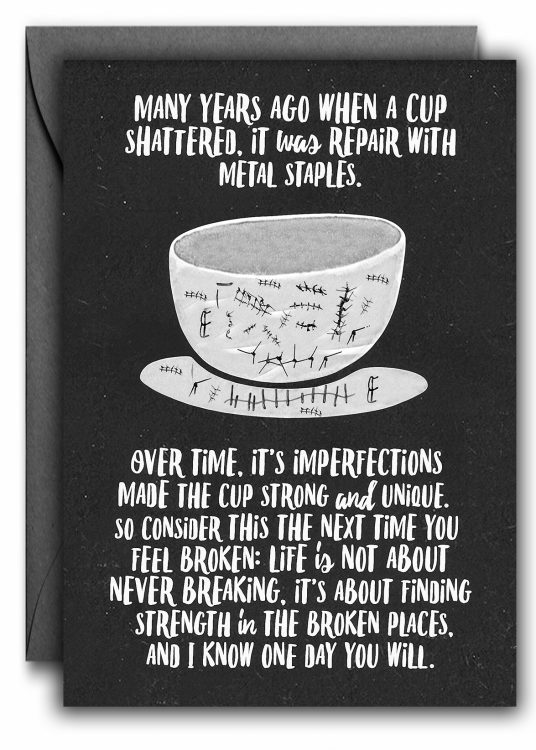 Cummings’ cards aim to help people connect with their loved ones who live with a mental illness when they’re unsure of what to say. Cummings’ cards cover a range of mental health conditions and experiences like bipolar disorder, depression and panic attacks. She researches each condition she writes about before designing the card. Cummings offers links to support resources on her web store and includes resources like hotline numbers in some of her cards. People with mental illness many times cannot connect with people. I believe that this is so because someone who is struggling in their own world has a very difficult time connecting to the regular everyday conversation. How do you talk about the weather when the weather inside your brain is a hurricane, and you’re trying to hide it from people? I think it takes a real friend to understand this loneliness in someone they know. In her spare time, Cummings writes music and lyrics for songs related to life, loss, and sympathy, which she hopes will resonate with others as much as her cards do. You can learn more about the cards at Anne Cummings Studios. Editorial Operations Intern for The Mighty and advocate for all things mental health especially in communities of color.